Stocking Stuffers Galore, and All Under $30! Crazy to think about how quickly we are approaching Christmas. Only 14 days to go and we are excited. At Amanda's House of Elegance we definitely have you covered for all your gift giving needs. We have a plethora of amazing stocking stuffers for every person on your list, including yourself :) Make your way downtown and come visit us, you are sure to find something to add a bit of elegance to your life and those you are gifting to! All of these stocking stuffers ideas are under $30 and are waiting to be purchased by you! With scents such as Vanilla and Sea Salt, Warm Wool and Bergamot and Basil, you are sure to find a scent to suit anyone on your list! 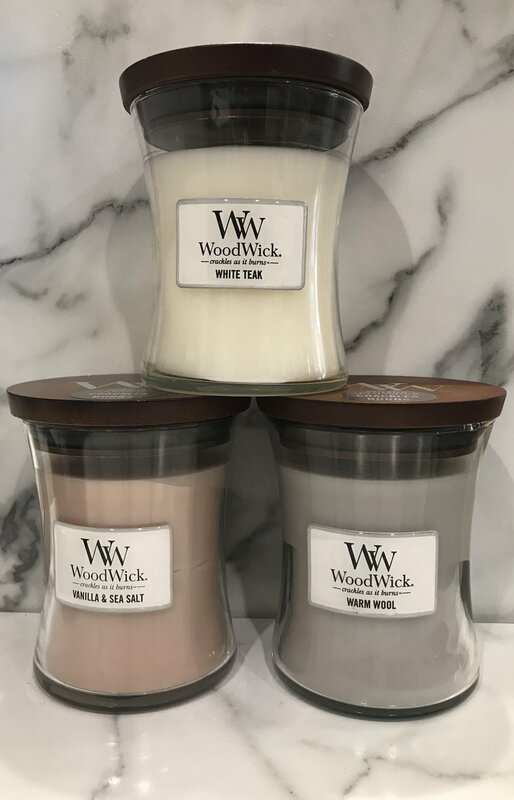 These medium candles ($22.95) have a burn time of 28 hours, though we also have larger sizes that range from 50 to 85 hours of a lovely crackling fire sound around your home. You have to hear these candles in action to believe it, but they truly sound like your own little personal fireplace. We have a few different styles and colours of mittens and gloves in the store and you won’t believe how warm and comfortable they are. A pair of mittens is always a great stocking stuffer because no one likes being cold; and like sock, one mitten always seems to be missing when the winter clothes get brought out each year making these the perfect necessity. 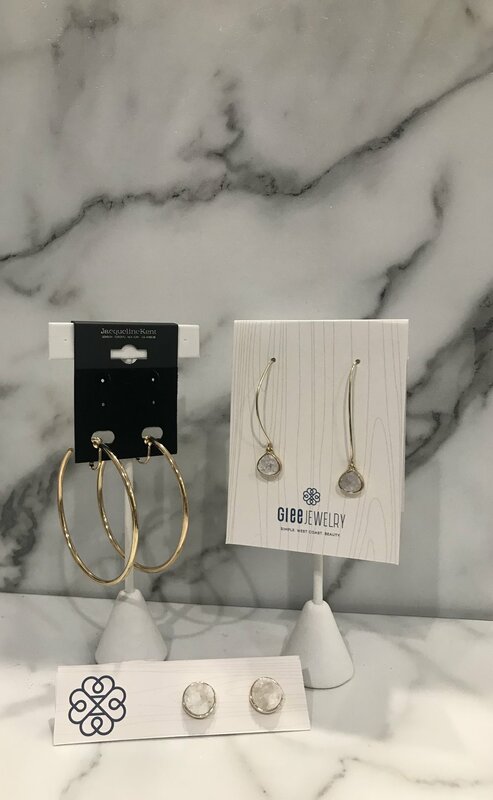 We are so proud to carry two different jewelry lines! The first is Glee Jewelry; they are based out of Vancouver and are influenced by nature and designed for beauty. The also have natural elements reflected in every piece. Glee uses a variety of high quality platings such as gold, rose gold and silver and they are all coated with an anti-tarnish polish to ensure a long life. All of the metals Glee uses are completely hypoallergenic as they are nickel and lead free. All of their pieces are stunning and a store favourite. The other jewelry line at Amanda’s House of Elegance is Jacqueline Kent Jewelry. This line is from Toronto and boasts unique and “one of a kind” designs. Each piece of jewellery is hand crafted with unique gemstones such as pearls, abalone shell, Swarovski zirconia, garnets, cubic zirconia, hematite and cut crystals. The metals used in Kent’s line are high quality base metals which include sterling silver, brass, steel and others. All pieces are nickel, cadium and lead compliant meeting North American safety standards and they are all hypoallergenic. If you love a stunning statement necklace this will be your new go to line. These bath bombs by Bomb Cosmetics are the real deal, as you can see by the video below. As soon as they are dropped into warm water they begin to fizz and release essential oils and perfumes into the water. Now all you have to do it relax, the rest is taken care of! We have many different scents available here at Amanda’s House of Elegance and all bath bombs are $8.95. We love the LAMA Soap Company and are so proud to carry this soap line at Amanda’s House of Elegance. We stand behind their natural approach to skincare and love how environmentally friendly they are. LAMA uses 100% pure coconut oil and only therapeutic grade essential oils for both its scent and holistic properties. The labels are all made with recycled materials and embedded with wildflower seeds so they be planted to feed the bees. Trust us when we say that these soaps are all luxury, and all natural! Each soap is priced at 10.95. Bee By The Sea is a Canadian natural skincare company. The entire company is based around the Sea Buckthorn berry because of its healing benefits to the skin. It is the combination of this superfood, along with unpasteurized honey that make Bee By The Sea one of a kind. They promote the benefits of their products to combat eczema, sunburn, dry skin, scars and many more. Their lip balm’s are nourishing and have the healing properties of the ingredients within leaving lips soft and moisturized. At 3.95 per tube, this lip balm makes the perfect stocking stuffer! Come into the store to check out our other Bee By The Sea products. The candle holders are purely pretty! The glass is cut in a way to allow light to be reflected off of the sides which make these an eye catcher. These are more elegant then your average tea light holder and are sure to impress the receiver. They are 13.95 each and are the perfect gift. We have such a lovely collection of mugs at Amanda’s House of Elegance and we think they would make the perfect stocking stuffer. With many styles available, you are sure to find a new favourite mug for someone on your list. There is nothing better then curling up over the holiday season with a hot drink and a good book! With Valentine's Day right around the corner, Amanda's House of Elegance in downtown Kingston has the perfect gifts for every person in your life! From the busy mom who needs a nigh of relaxation, to the chef in your life, this unique list will give you gift inspiration for last minute gifts. In fact, they are so good no one will even guess they were a last minute find. This personal fireplace is a cozy gift for the cottage lover in your life. It's and the perfect way to warm up any room in your house. Adding this mini fireplace to your space will give a unique touch and give off a beautiful glow. Pair these beautiful wine glasses with your favourite bottle of wine for a classic and thoughtful gift! They are a stunning soft grey and will compliment any table scape for a romantic dinner in. Anyone who loves to cook and loves to entertain knows the importance of presentation and ambiance. The chef in your life will love this marble slab for serving food, setting up a charcuterie board, or displaying deserts. The gorgeous white marble is a show stopper and your food will never look better! This 5-peice silverware set is the perfect gift for anyone who loves to entertain! This set is perfect for a group of 8, your guests will never eat off better utensils! Hint: Anniversary #25 is the year for silver! This would be the perfect gift. Amanda's House of Elegance is so proud to carry such beautiful and clean brands in house. All our spa and bath products are great for sensitive skin and will feel just as luxurious as being at the spa. We carry a great line of handmade soaps from L.A.M.A. Soap Company, as well as a variety of of bath bombs, bath soaks, and all natural deodorant and dry shampoo. We, at Amanda's House of Elegance, have curated lovely collections of the products perfect for your loved one! These beautiful throws come in a variety of colours and are the perfect gift for anyone who loves to cuddle up and get cozy! This mustard waffle knit is one of our personal favourites at Amanda's House of Elegance, we will be jealous of whoever gets to take this stunning throw home. This silver plane is the perfect gift for anyone who loves a good adventure. This plane would be stunning on a bookcase or desk and would be the perfect reminder to those who have dreams of leaving the office and going on a big adventure. At Amanda's House of Elegance we have a variety of gift baskets just waiting to be given as the perfect gift! They are all uniquely filled with a variety of products to suit everyone. Come downtown Kingston and check out the great finds in these baskets! The biggest celebration of the year is just around the corner and your gift list seems to grow by the day! At Amanda’s House of Elegance we have gifts for everyone on your list from teachers to colleagues, best friends to sisters and your spouse as well. Following are some gift suggestions across various price points that will help you get your shopping wrapped up. 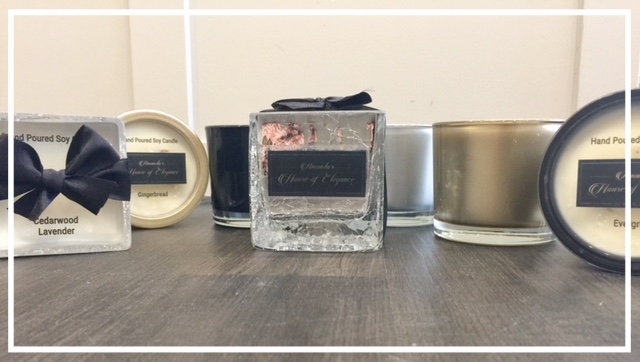 Soy candles burn evenly and cleanly and these ones, custom poured for Amanda’s House of Elegance, are available in a wide variety of scents. These make perfect gifts for the hostess, office gift exchange or the teachers. Hand Poured. 100% Soy. Exclusively at Amanda's House of Elegance. There is a large selection of unique tree and table top ornaments ranging from elegant and traditional, to woodland and whimsical and more. Christmas Tree Table Top Decor. Hurricane jar candle holders add a festive, cozy touch to any decor and there is a wide variety of sizes, colours and styles available. A beautiful gift for your bestie or sister! Picture frames are a beautiful gift for someone who has celebrated a special occasion during the year such as a wedding, graduation or birth of a baby. Amanda’s House of Elegance has a large selection from smaller 3x5 frames to larger 8x10 frames in styles and finishes to suit every decor. If the gift recipient is looking for that special touch to finish off a room, how about a Canadian made 100% goose down filled pillow? The unique fabrics and styles will ensure a one of a kind look in their home and be a gift that endures. Cow Hide Feather Inserted Pillows. Gift baskets packed with a variety of treats and treasures are sure to delight! Amanda’s House of Elegance has custom made baskets wrapped up and ready for gifting. From Amanda's House to yours, you will enjoy these hand curated, exclusive gifts. If your recipient is an art collector, consider a hand painted piece from Mercana. The range of pieces means there is a choice for every taste and style. The 3D pieces are especially popular and visually appealing. Large hand painted canvas art. Fitz and Floyd’s collection of handmade Christmas pieces across a variety of price points are exclusive to Kingston through Amanda’s House of Elegance. These pieces are collectibles that will delight for many Christmases to come! Amanda’s House of Elegance has you covered! We have gift certificates available that you can purchase in any amount and which allow the recipient to shop for their fav item or items once the holiday rush is over.